Season 4: And so, for the fourth successive time, a full set of Radicals, plus chums, descended on the Model Market and were pleased to be able to secure our favourite perch to enjoy an evening of street food and people watching. 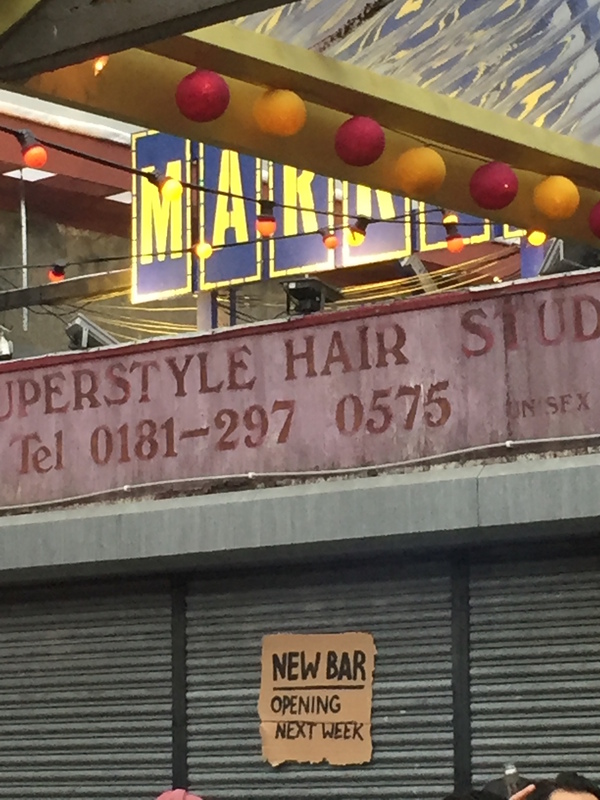 (You’ll understand of course if we don’t reveal where said perch is – nothing personal – except that it’s within easy striking distance of the main bar. Obvs. ). Thankfully the weather was kind, despite the dark clouds overhead, and indeed remained remarkably mild throughout the evening. Aided by what seemed like more heaters than before and the familiar smokey warmth from the braziers. 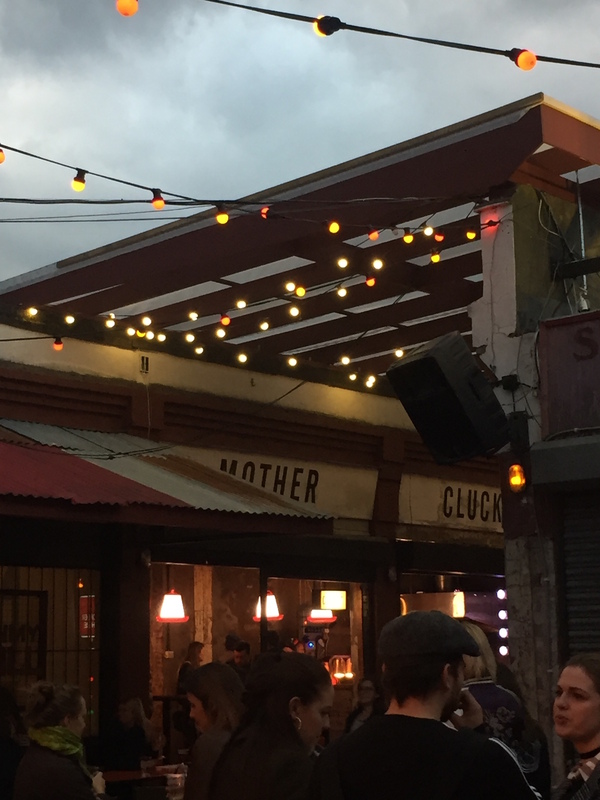 One addition – we were perhaps a tad too excited to notice (though it gave us something to talk about) – was that of a roof over the street to the left as you look from the main bar (the one you enter the place on). It also looked like the roof on the other side had been improved. Which will be very useful when the weather does turn for the worse. Enough on the roofs. There were also quite a few changes to the food outlets. 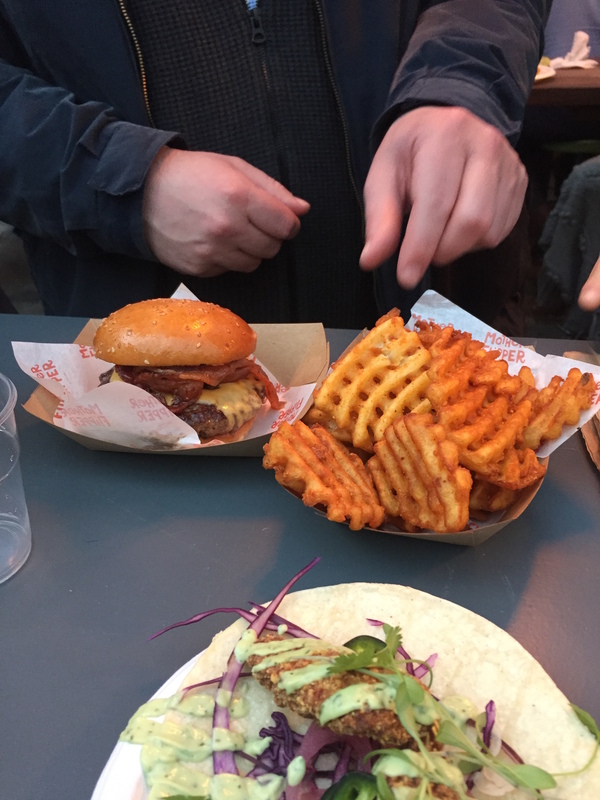 The much anticipated Namban – Japanese street food based in Brixton – was there. And its Eringi mushrooms went down well. Less popular was the new taco place (Tacos del Rey) which seemed to take an age to assemble and then underwhelmed when they were. Worth a second visit though as it’s not impossible that having taken the spot of past favourite Yum Bun had something to do with the verdict. 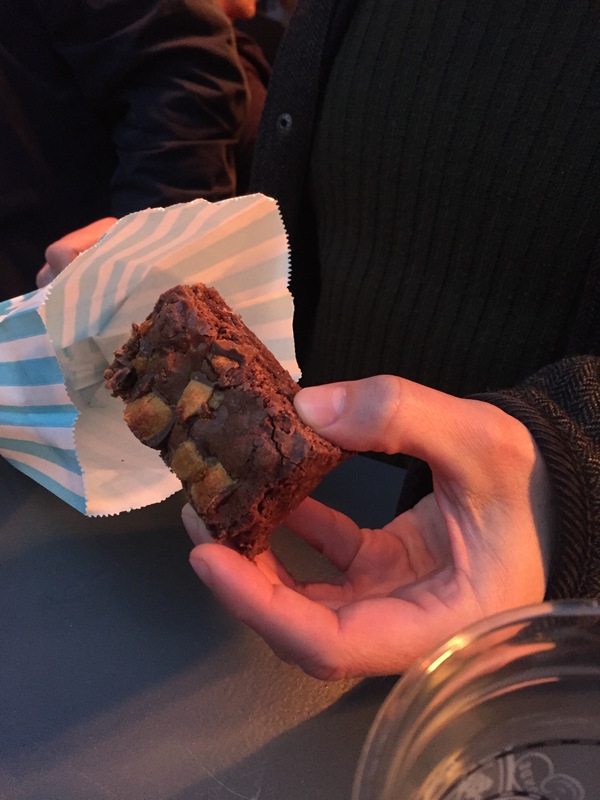 The SE Cakery, which provided one Radical with a much envied, apparently very tasty, and resolutely un-shared, chocolate brownie, is now in place of what was the rather popular hot-dog shop. As mentioned, stalwart Mother Flipper is still there as is Mama’s Jerk, whose jerk chips rather divided opinion, though were demolished in good order. The Italian place (‘Cheeky Italian’?) has gone as has ‘Smokestak’, Rola Wala and no doubt some others we’ve forgotten. There’s also a new Venezuelan place that was a big hit. A new bar is due to open next week (in the shop opposite the main bar which seemed previously to be used for particularly, ehm, relaxed, people to sit in) and the main bar itself now offers Sierra beer which offers a very welcome alternative to the Frontier lager. Winyl is still there though no longer providing the music, with the DJ station having re-located to the main bar. Despite the relocation the music doesn’t appear to have changed much, which prompted the other main topic of conversation of the evening (having calmed down about the roof and had a rather unexpected discussion about Winnie Mandela – don’t ask). So, the problem with the music is that it consists of a series of tracks that contain familiar beats from popular songs (think Beat It, by Michael Jackson or some of the more bass-laden David Bowie tracks) but without actually breaking in to the up-tempo part of any of those tunes. Which. Is. Very. Frustrating. And not at all conducive to people dancing, if that’s your thing. A bit like having your songs on some sort of ‘first 30 seconds only’ shuffle so that you never get the opportunity to belt out the chorus. It wasn’t always like this and indeed some of the Revolt’s first visits to Model Market were memorable for there being a great deal of dancing (which we observed in a dignified manner of course) but at the last few visits there has not, and in our view this is partly due to the music being played. 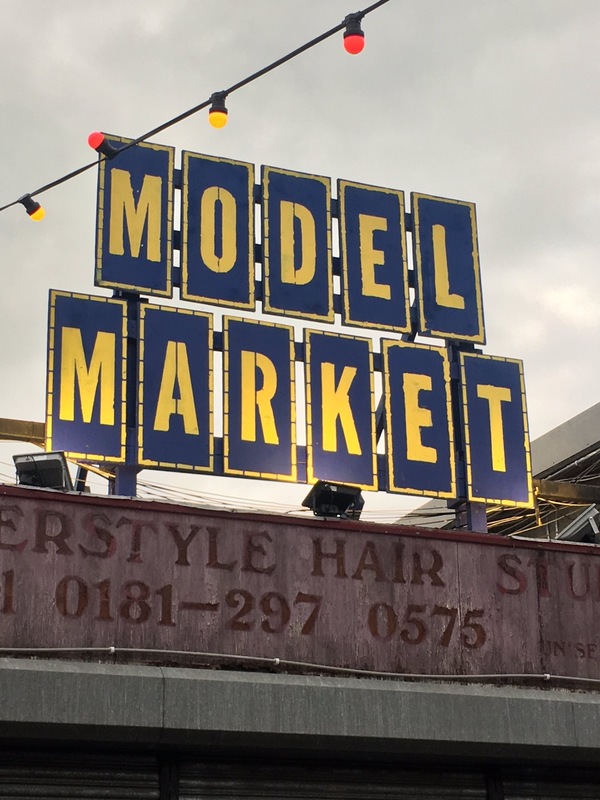 After another ale and having by now exhausted all sensible topics of conversation and resorted instead to sending people amusing whatsapp messages the Revolt finally left Model Market satisfied at having seen it open for a fourth year in a row. Which is something worth reflecting on; what the people behind this place have done with a seemingly futureless site, and that it has been such a success for the past three years and still going strong, is really impressive. It’s given the area something it lacked as well raising its profile across the city. And, as our thoughts on the music no doubt reveal, it provides the Revolt with possibly the only ‘trendy’ venue that we attend with any regularity and, somehow, really like. This Post was posted in Blogheath Boozers and tagged lewisham, model market, street feast. Bookmark the permalink.